This Chicken and White Bean Soup is a warm inviting soup is a hearty weeknight dinner that, with the help of a rotisserie-cooked chicken, can be made in minutes. 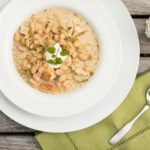 Tender leeks, freshly chopped sage, and hearty cannellini beans give this white bean soup a deep aroma and rich flavor profile. This recipe makes eight servings and makes an ideal meal prep dinner. The flavors meld and deepen on day two so the leftovers will be joyous. 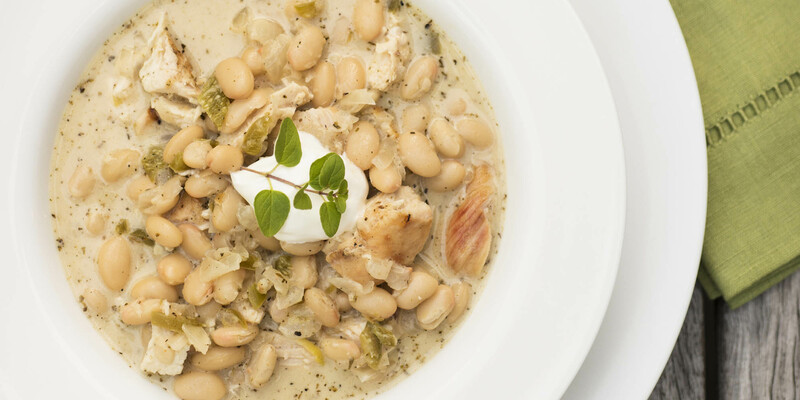 Tender leeks, freshly chopped sage, and hearty cannellini beans give this Chicken and White Bean Soup a deep aroma and rich flavor profile. Add leeks; cook, stirring frequently, for 3 to 4 minutes, or until soft. Add sage; cook, stirring frequently, for 30 seconds, or until aromatic. Add broth and water. Bring to a boil, covered. Reduce heat; cook for 5 minutes. Add chicken and beans; cook, uncovered, stirring occasionally, for 5 minutes, or until heated through. Divide soup evenly between 8 bowls. Top evenly with a dollop of yogurt and microgreens.